Earlier in the month we reported on the successful launch and docking at the ISS of SpaceX's Dragon capsule. Dragon CR-2 splashed down in the Pacific on the 26th of March ready for recovery. Dragon has returned to Earth the results of a number of science experiments, over 200 of which are ongoing on the International Space Station. The results returned include from experiments on improved food and crop production both in space and on Earth and improved solar energy panels. In total 1,200 KG of material was returned though of it was waste materials (you can't just kick your trash out of the airlock! 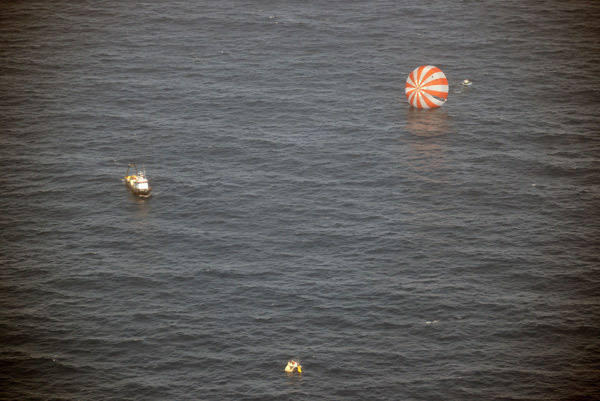 ), some of it has been transferred from the Dragon capsule as soon as it reached dry land with the rest staying in the capsule until it returns to SpaceX's facilities in Texas.